It�s the first day of spring and maybe there is still a hint at a subtle chill in the air, but you can already imagine those beautiful roses flourishing in a vase on your table. Don't fret, even before the flowers bloom, the birds take up residence just outside your window, and the sun melts the frost from the windows, you and your dog can begin enjoying the flowers early with this combination of mild, yet striking combinations of color and stunning finishes! You might begin to smell roses all year around. The fluidity of warm light pink tones in this necklace, is quite possibly what makes the Blush Rose Frost one of our personal favorites here at W�lf Grace. 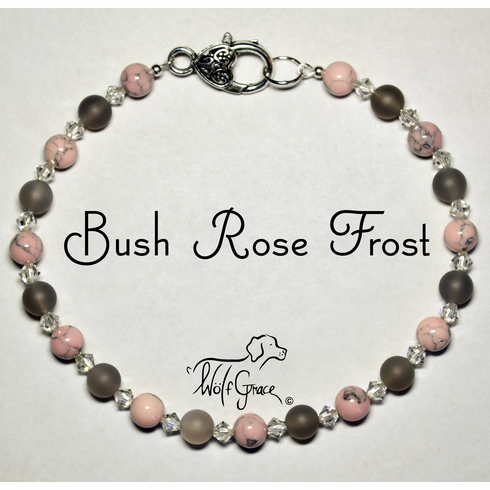 Look at the way the 8mm round Blush Pink Magnesite Beads, and the 8mm round Frosted Smoke Gray Agate alongside 4mm bicone Crystal Satin Swarovski, smoothly sweep along the Sterling Silver jewelry-grade wire. Notice on each end of the necklace, how the Sterling Silver crimp covers reinforce and conceal the Sterling Silver crimps, which hold the beads securely in place.